and FIDO (Certified by Fast Identity Online (FIDO) Alliance), otherwise it is not a safe fingerprint scanner for computer. 2. Fingerprint Reader: password-free login for computer/laptop/desktop/PC with OS Windows 10 Hello 32/64 bits. 3.USB Sensor Drivers: drivers downloaded and installed automatically,which took a few minutes. Settings>Accounts>Sign-in options in Windows 10 >create a PIN, and enroll your fingerprint. and the recognition effect will be better and faster. ), up to 10 fingerprints. 5.360 degree Touch: Try to touch your finger by different area, it will read sooner, recognize and login in 2 seconds. There are only 3 matches at a time, so please switch to PIN code to login if you failed. with this smart-learning sensor, you can login your device in 2 seconds. 360 degree Touch: Try to touch your finger by different area, it will read sooner, FRR<3%, FAR<0.002%. Built-in "Smart Learning" Algorithm: every time you sign in with your windows devices, the algorithm tracks on your fingerprints, the analysis becomes faster and faster, with this smart-learning sensor, you can login your device in 2 seconds. 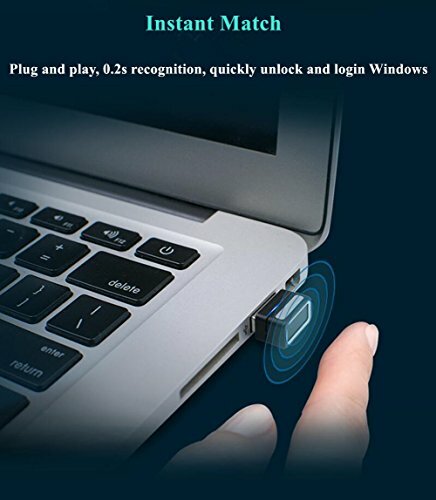 USB Biometric Sensor Register: plug and play on Windows 10, drivers downloaded and installed automatically, which took a few minutes, go into Settings>Accounts>Sign-in options in Windows 10 >create a PIN, and enroll your fingerprint, up to 10 fingerprints. If you have any questions about this product by Power Trend, contact us by completing and submitting the form below. If you are looking for a specif part number, please include it with your message.